Last edited by tchaiku; 05-23-2018 at 04:22 AM. I'm pretty sure eupedia maps lack peer assessment. If anyone can prove me wrong, please do. 30% Y-DNA in Macedonia seems about fine. It is quite high in Crete though. Unlike many non-Russians, the Volga Finns have long had the option of “becoming Russian.” By doing so, of course, they lose their identity and threaten the future of their ethnic groups. But Finnic-speakers, whose lands once encompassed all of northern and eastern European Russia, have been acculturating into the Russian ethnos for more than 1,000 years. Some scholars think that the Russians themselves are descended as much from Finnic- as Slavic-speaking populations. 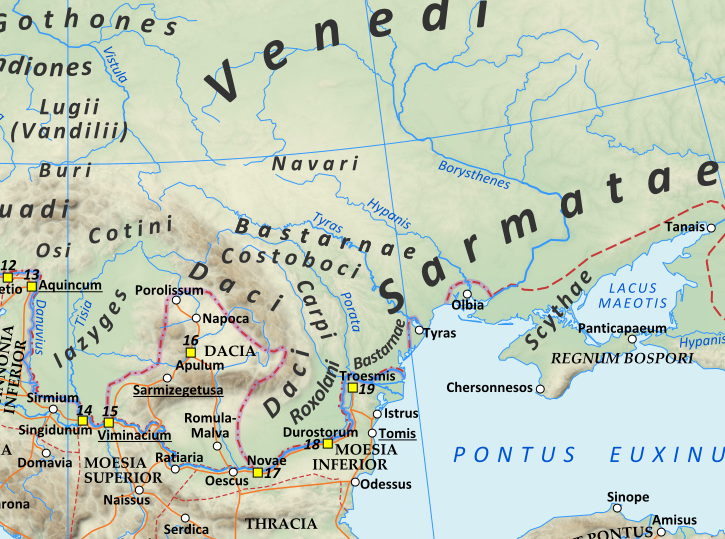 The origins of the Russian people and state, most agree, can be traced back to the 9th century CE, when Swedish Vikings began to push through the rivers of western European Russia, Belarus, and Ukraine, seeking opportunities to raid and trade in the Black Sea region of the Byzantine Empire. According to the conventional story, the Norse provided the initial leadership of the region’s emergent kingdom of Rus’, but they soon submerged into the dominant Slavic-speaking population that they ruled. It is now clear, however, that many Finnic-speakers were also incorporated into this state. According to the Estonian-American political scientist Rein Taagepera, “The Scandinavians provided the leaders and the name Rus’; the Slavic languages prevailed; and a major part of the genetic pool came from the Finnic tribes” (p. 46) (The “genetic pools” of the Finns, the Norse, and the Slavs, however, are much the same). Another major infusion of Finnic peoples into the Russian ethnic formation came during the late 11th and early 12th centuries. By this time, the once-united Rus’ state had splintered into smaller principalities. After a powerful new confederation of Turkic-speaking nomads (the Cumans) moved into the southern grasslands, Russians began to relocate to the northeast, pushing into the upper Volga territories of Finnic-speaking Merya, Muroms, and Meshchera. Over the next several hundred years, these eastern Finns gradually disappeared, their populations merging into that of the Slavic-speaking Russians. In the 1300s and 1400s, this ethnically mixed upper Volga area emerged as the focus of a new Russian state that would eventually transform into the Russian Empire. 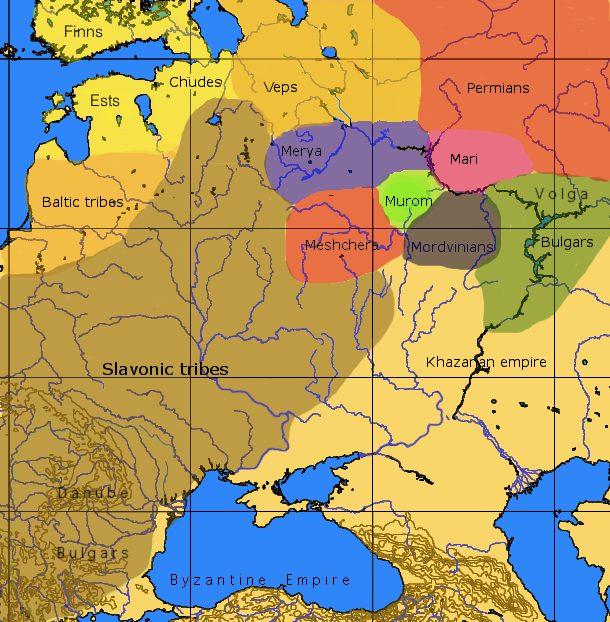 Finnic peoples, Slavic peoples and Khazars in c. 9th century. Last edited by Carlin15; 05-25-2018 at 10:40 PM. It is generally accepted that South Slavs are heavily mixed with Natives. But I wonder what exactly were the Slavs that overran Greece? I'd speculate that they might have been mixed / assimilated with Scytho-Sarmatian elements (perhaps even other groups, such as the Avars or northern Dacian tribes). PS: Alans, who were an Iranian nomadic pastoral people ended up migrating during the 4th–5th centuries AD. The Alans spoke an Eastern Iranian language which derived from Scytho-Sarmatian and which in turn evolved into modern Ossetian. The migrations of the Alans during the 4th–5th centuries AD, from their homeland in the North Caucasus. Major settlement areas are shown in yellow, Alan civilian emigration in red and military campaigns in orange. During the Middle Ages, Byzantine chroniclers claimed that Catalonia/Catalania derives from the local medley of Goths with Alans, initially constituting a Goth-Alania. Last edited by Carlin15; 05-26-2018 at 12:44 AM. Dacians seem too northern for modern Greeks, maybe Illyrians and Thracians? What do you mean by too northern?